RISC Managing Partner Martin Wilkes will be speaking at the first event on the Australian Institute of Energy calendar for 2019. 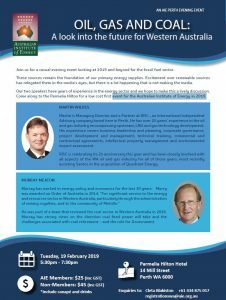 The casual evening event “Oil, Gas and Coal: A look into the future for Western Australia” will explore what 2019 and beyond is set to look like for the energy sector in Western Australia. Martin will be one of two speakers for the event, joining Murray Meaton who has worked in Australian energy policy and economics for the last 30 years. Book your tickets now to secure a spot for what is set to be a lively discussion on the future of our industry in WA. Register through the event page here. You can also stay up to date with all the latest news at RISC Advisory by connecting with us. Contact us and one of our team member will get back to you as soon as we can. Copyright © RISC Advisory 2019. All rights reserved.